See, the advantage of my Gleemax blog is that when a weird and random thought pops into my head, I can just throw it out on the Internet. Or else that's the disadvantage. I can't remember which. There it is! The other article I wrote to support Dragon Forge is up on the Wizards site—an exploration of the relationship between the rules of the game and the writing of a novel, seen through the lens of the transition from 3rd Edition to 4th. Check it out! I've added this category to point to posts on my Gleemax blog. As I said over there, I feel like my life will be easier if I put links here to posts I make over there, and vice versa. As if, somehow, that will make easier the decision of which blog to put a particular random thought on. 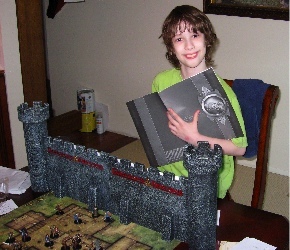 We had a D&D-filled weekend after the Seattle Game Day, but my son wasn't eager to take a turn behind the DM screen—despite the fact that I think he'd be a natural at evocative description and exciting encounters. Well, then today I got one of those awesome resin castle "screens" from Alliance and Gale Force Nine, which he had been drooling over at the Game Day event. (The picture doesn't show the center section—one tower was broken off in shipping, and the Krazy Glue was drying when I took this shot.) That made DMing a lot more appealing. So we had an encounter in the inn—an evil wizard animated a sculptor's statue, which attacked and then turned into rocky minions when we destroyed it. It was great. The kids, they love the toys. Dragon Forge is out, and it's featured prominently on the Wizards Books site. You can download chapter 1, which—even if I say it myself—is a pretty awesome chapter. I'm hoping that the interview and article I did will also show up there soon. Have fun playing D&D this weekend!